Fresh corn is often so sweet and tender that there is no need to cook it. Basil takes the taste of the salad to a different level altogether. The purple cabbage not only makes the salad crunchier but also makes it more colorful. 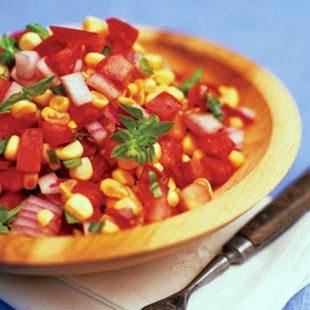 1.Over a large bowl, cut kernels off corn cobs and stir in tomatoes, purple cabbage and onion. 2. Toss with vinegar and basil; season with salt and pepper to taste.